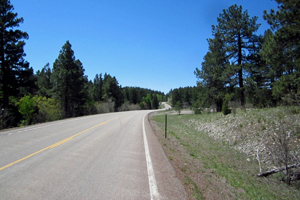 Starting on James Canyon Highway (US-82) in Cloudcroft, take a left and start heading south on Cox Canyon Highway (State Road 6563). After a little over a mile and a half, bear right to stay on SR-6563, which turns into Sunspot Scenic Byway. Sunspot boasts some of the best riding road around. There are plenty of twists along this well-paved highway, along with some fun up-and-down hill country. Plus, stunning vistas from this forest oasis can’t be beat. You can even catch a glimpse of the famous WhiteSands at Alamogordo to the northwest. About 15 miles in, you will see signs for the NationalSolar Observatory. You can choose to wander around and stretch your legs on your own or opt to take the guided tour and learn all about this neat astronomy center. Next, turn right onto Sacramento Canyon Highway and continue heading south. From there, either head 14 miles straight to Timberon, a sleepy camping village nestled on the southern slopes of the Sacramento Mountains, or turn left onto Scott Able Road and continue winding your way around. After 3 miles, turn right onto Agua Chiquita Road and enjoy the twisties! Continue on through the town of Weed and turn left onto Route 24. After 5 miles, turn left onto Rio Pensaco road and head back toward Cloudcroft on Cox Canyon Highway. I think this is a great opportunity for the guys to learn something new. But at the same time, university and college students are extremely busy with tons of homework. I was also a student a few years ago, and in order not to spoil my grades, I used a great service https://au.papersowl.com/buy-assignment-online that helped me to write the right assignment online in Australia. For example, I found there an excellent and useful paper writing reviews and used this platform for a long time.